Cast: Kamikawa Takaya, Saito Yuki, Yashima Norito, Tanaka Tetsushi, Okada Yoshinori, Masana Bokuzo and Mashima Hidekazu. 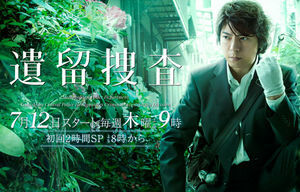 This is the second season of the drama series. This season has a bit more humor as well, and honestly, it is much more relatable, though I have to say, I am very surprised of how Itomura manages to find all those thigs out - but that is TV for you. All in all, a good season, but better than the first one.